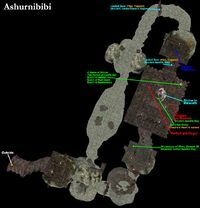 Ashurnibibi is a shrine to Malacath on a small peninsula north of Hla Oad. The ruin has been taken over by Orc kidnappers. You'll have to travel here to rescue Joncis Dalomax in an Imperial Legion quest for Imsin the Dreamer in Buckmoth Legion Fort. The shrine also contains a few skill-improving books. 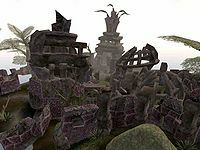 There's also a quest available from the Daedra Prince Boethiah nearby, but you'll have to dive deep underwater to find him (west and a little north of Ashurnibibi - not in the underwater passages inside Ashurnibibi). There are lots of critters in the water, and they seem just to keep coming. Unless you are an Argonian, you may want to water-walk. Look for the shattered statue, unless you want to explore the sunken ruin. Durgash gro-Rushub carries an Ancient daedric Key which opens a locked and trapped door, behind which Joncis Dalomax is being held hostage. 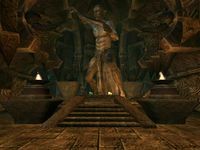 There is another Ancient, rusted Daedric Key in a chest in the Shrine which opens a back door to the room where Joncis is, accessed through a flooded tunnel. On the altar you can find a ruby, a piece of raw ebony, an emerald, and a cursed Daedra's heart. The two Orcs outside the shrine might be peaceful when you meet them, their fight values of 80 rather than the typical 90 allows a greater chance of this. However, you must kill the two inside to rescue Joncis. Ushug gra-Olurba offers medium training in Acrobatics, Light Armor, and Sneak if she is non-hostile or successfully calmed. This page was last modified on 8 September 2018, at 03:45.